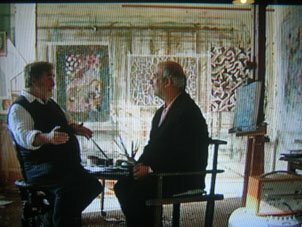 Filmed earlier this month at his London studio TP is interviewed by Alan Yentob for the BBC documentary Imagine.Made to coincide with the first major exhibition of Diego Velazquez's work at the National Gallery, Imagine presents a portrait of the artist regarded by many as the greatest painter of all time. Alan Yentob travels to Seville, Madrid, Rome and New York tracing Velasquez's footsteps and meeting artists and critics who add more to the story. I watched this - interesting programme and interesting interview.